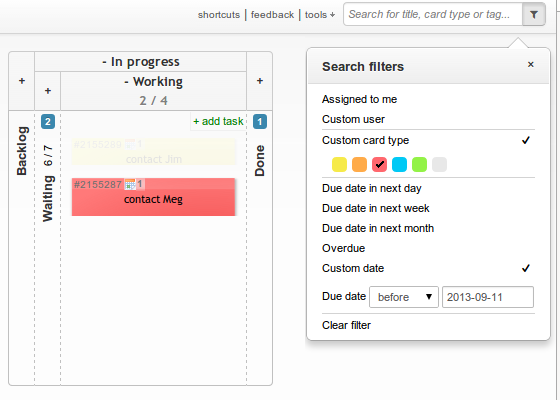 We’re happy to announce the launch of search filters for Kanban Tool boards. This feature will allow you to gain even greater visibility and control over your workflow. You can use search filtering option to see only these tasks that are assigned to you or to any of your team members. Moreover, you can filer cards by the custom card type and by due dates. You need more advanced filtering? No problem. You can use multiple filters together. We hope you like the new features. We are constantly improving our online kanban boards to better meet your needs.